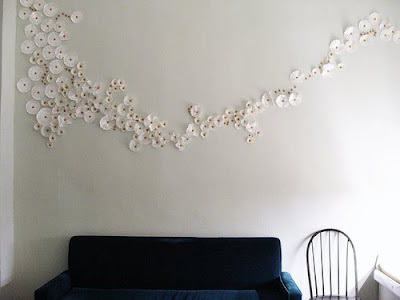 Did you see this pretty, simple, incredibly cool wall over on Creature Comforts? that is really, really, really, really, really cool. dammit! damn jordan's concrete and marble construction. I saw this and I loved it instantly. I know... don't you LOVE this!!! I have the same problem as you Karey... concrete. Yesterday I was just musing on how I could complete this effect with my impenetrable walls and decided on sticky tabs and faux tack heads (glued on) - this idea is courtesy of my brilliant friend Melissa. GET OUT!!! I am doing this...I love it. Thank you Ms. Joslyn for the idea!! !